Moving to New York has taught me a lot about dressing in a way that's not only stylish, but also practical and comfortable. Back home in California, it was easy to just throw on whatever I pleased because of the year round mild weather and the fact that I didn't walk to and back from school each day. Now I've learned that it's not just about looking good, but feeling good too. Nobody wants to show up to class being cold and in a state of physical discomfort, that's for sure. This outfit not only kept me warm and comfortable, but was also edgy enough for my taste! My bodycon dress, crossbody bag, and fuchsia lipstick are all pieces from Lulu*s I got recently. This dress will certainly become a staple in my wardrobe as it's black, easy to style, and has a surprise twist with the cutout at the bottom. The bag is a great size for carrying my folders and supplies to class, and the lipstick is sure to brighten up any morning as I rush to get ready for class! 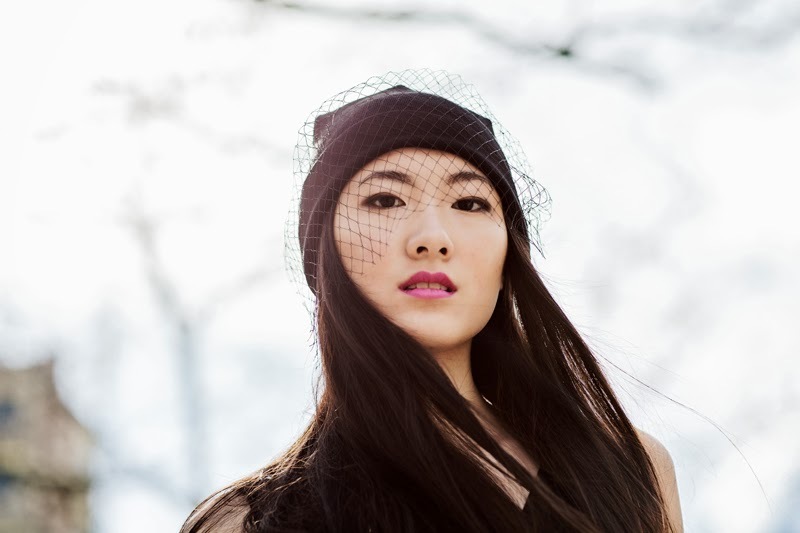 I was also very excited to sport my mesh beanie from Choies––it adds such a romantic element to a normally grungy piece. Happy Valentines Day! This look is my entry to the Lookbook Valentines Day contest which I've entered with my boyfriend, Chris! We have been in a long distance relationship ever since I moved to New York which is why we titled our looks "Sending You My Love." Although without me telling you that we are on opposite sides of the country, you can probably tell just from looking at the settings we've taken our photos in––while he is enjoying the warm California sunshine, I am still waiting for the snow to melt in New York! ;) You can see the look he put together here, and if you want to help us in the contest, you can give either or both of us a "heart" on Lookbook! Chris is going to be starting a fashion blog soon as well, so I'm very excited to get to share one of my favorite hobbies with him. I recently found the perfect faux leather jacket from BCBGeneration and I've been wearing it so much! In looking for a leather jacket, the toughest part for me is finding one that fits tightly in the arms. I am very happy with this one and can't wait to wear it around more! I'm also wearing an adorable heart ring from Love Nail Tree. It would of course be a cute accessory any day, but is even more fitting for the Valentines Day occasion! I would also like to send all my readers some love and I hope that you have a happy Valentines Day!